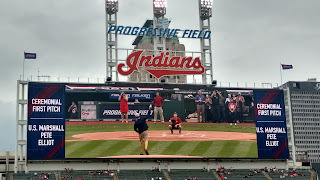 On Saturday, September 17, the Cleveland Indians brought their entire "Tribe" out as the Indians battled the Detroit Tigers in extra innings as they continue to fight for the playoffs and a chance to win the American League Central. The Indians won 1-0. 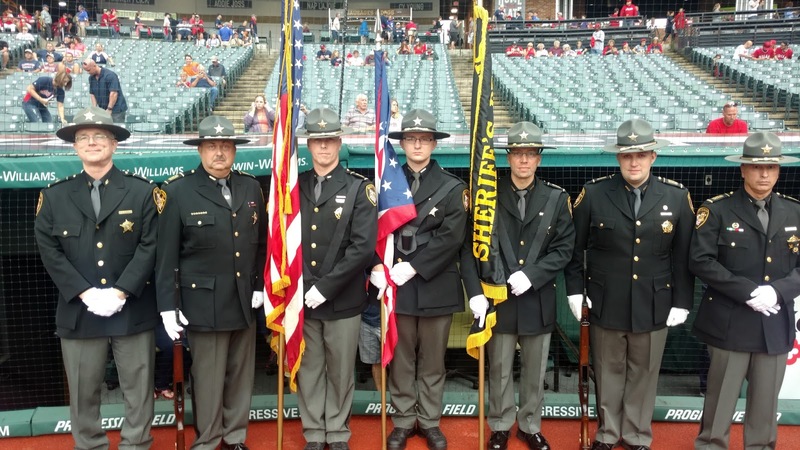 Not only was it a big win for the "Tribe" but it was a special win for law enforcement as the Indians held their annual Law Enforcement Night at Progressive Field. Before the game started, a moment of silence was held in honor of Ohio State Trooper Kenneth Velez who was struck and killed by a vehicle while conducting a traffic stop in Cleveland on September 15. Trooper Velez is the seventh officer to be struck and killed in 2016 and the fourth law enforcement fatality for the state of Ohio. 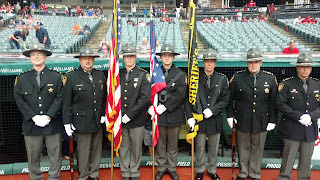 The National Anthem was performed by Sergeant Michael Maughmer of the Ohio State Highway Patrol as the Cuyahoga County Sheriff's Department Honor Guard presented the colors. Throwing out the first pitch (which was a strike) and representing Federal Law Enforcement was Ohio native and current United States Marshal of the Northern District of Ohio Peter Elliott. Despite the overcast weather, 26,654 were attendance to witness a great game and a great night supporting law enforcement, which raised over $2,700 for the Memorial Fund. The National Law Enforcement Officers Memorial Fund would like to thank JP Makari and the Group Sales Team, Cleveland Indians Community Impact Team, Bill Swank, Ohio Chiefs of Police Association, Federal Law Enforcement Officers Association Cleveland Chapter and the Ohio Fraternal Order of Police for their support and making it a great event. Also around the league, Texas Rangers also hosted Law Enforcement Night on Saturday, honoring our August 2016 Officer of the Month Award winners Ed Pietrowski and Michael Sarro. This event was held in partnership with the Texas Rangers and the Police Officers Angel Foundation. Special thanks to Maria Alvarado and Zak Ganter. For the latest law enforcement sporting events, visit www.lawmemorial.org/sports. 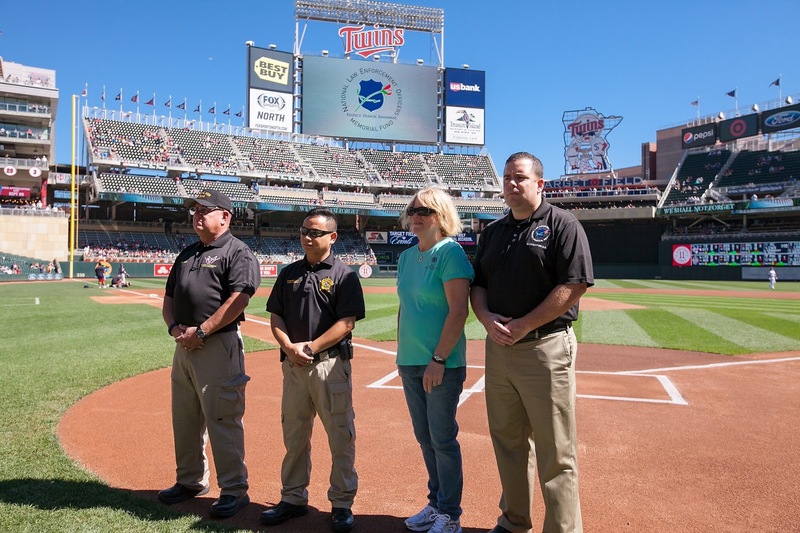 The afternoon game on Sunday, Sept. 11, was a day to remember in the Twin Cities as the Minnesota Twins and the Cleveland Indians honored and recognized Minnesota law enforcement and paid tribute to those who died on the 15th anniversary of the terrorist attacks. Great weather was on hand as more than 20,300 were in attendance for Law Enforcement Appreciation Day. Before the game, representatives from the Minnesota Law Enforcement Memorial Association, Minnesota Sheriffs Association and the Concerns of Police Survivors’ (C.O.P.S.) Minnesota Chapter gathered at home plate as the St. Paul Police Department Honor Guard presented the colors during the national anthem. The Minnesota Twins Territory Flag was raised and saluted by the Federal Law Enforcement Officers Association’s Minnesota Chapter. The Minnesota Twins salute law enforcement and thank everyone for attending and supporting the annual event. The National Law Enforcement Officers Memorial Fund would like to give special thanks to Luis Breazeal and Sam Henschen and to the Minnesota Chiefs of Police Association for going above and beyond and making this a great event. Other NLEOMF events that took place on Sunday, Sept. 11, included games with the New York Yankees and the Houston Astros. For the latest in law enforcement appreciation sporting events visit www.lawmemorial.org/sports.